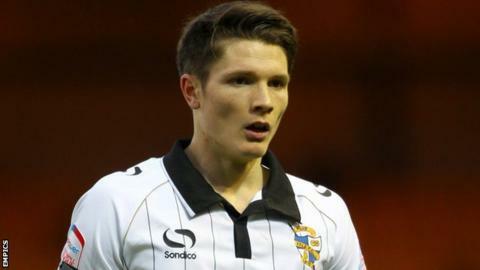 Port Vale have parted company with midfielder Ryan Burge "by mutual consent", following an internal row over comments that he made on Twitter. The 24-year-old, who began his career at Birmingham City, had initially been suspended for 14 days for a breach of the club's social media guidelines. Burge was left out after Vale's 2-1 defeat at Oxford United on 2 March. He then criticised the club on Twitter after being told not to attend the game at Bristol Rovers on 12 March. A club statement said: "Burge claimed that he'd been told not to bother turning up at the game that night by the club's management. "The club themselves said they'd told him not to go as he'd failed to turn up for the team's pre-match meal hours earlier." Vale boss Micky Adams described Burge's comments at the time as "absolute nonsense". Valiants chairman Paul Wildes added: "This has been a difficult decision for both parties. "We would like to wish Ryan the very best success in the next step of his career." Burge, whose grandfather is on the board at his hometown club Cheltenham Town, was signed on a two-year contract by Adams in June 2011. He missed most of last season with a knee injury, but had made 35 league and cup appearances before his public fall-out with the club.